Yesterday, Microsoft released Cumulative Update KB4284848. As usual, I updated all eligible machines once I noticed the update was available (this morning). On all six PCs, the update was attempted. For five of them, it succeeded without difficulty. On the sixth, however, things quickly became interesting. First, WU had difficulty scanning for this update. But even after I downloaded the .MSU from the Microsoft Update Catalog, it stalled out at “Checking for updates.” And alas, it never got around to installing anything. Thus, I turned to the Windows Update MiniTool, aka WUMT, to see if it might help before attempting more serious WU repairs. Happily, WUMT resolves update woes yet again. It managed to download and install KB4284848 without difficulty. 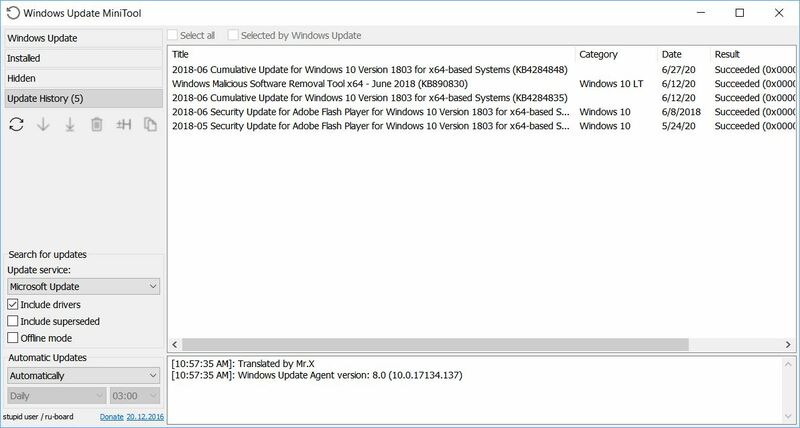 WUMT Update History shows all applied updates since the last Feature Upgrade. Obviously, something odd was up with Windows Update on this PC. Specifically, the update check function seemed stymied somehow. This is the first time I’ve seen a manual catalog-based update fail because its own built-in update checks couldn’t (or wouldn’t) complete. WUMT uses a different method to interrogate the WU servers. And apparently, WUMT succeeded even when the built-in update functions weren’t working properly. Even so, WUMT didn’t report on the download of KB4284848, either. It simply showed progress bars for Updates 1 and 2, but didn’t report on download progress in the status bar as it is normal behavior. There’s no doubt that something odd and interesting was up on the T520.